Welcome to all the lovely girls on the block…:) Love to have u on my blog! Recently I hit 200 Followers on My blog & 500 on my Facebook page! So This Giveaway is for all of you who helped me reach here! 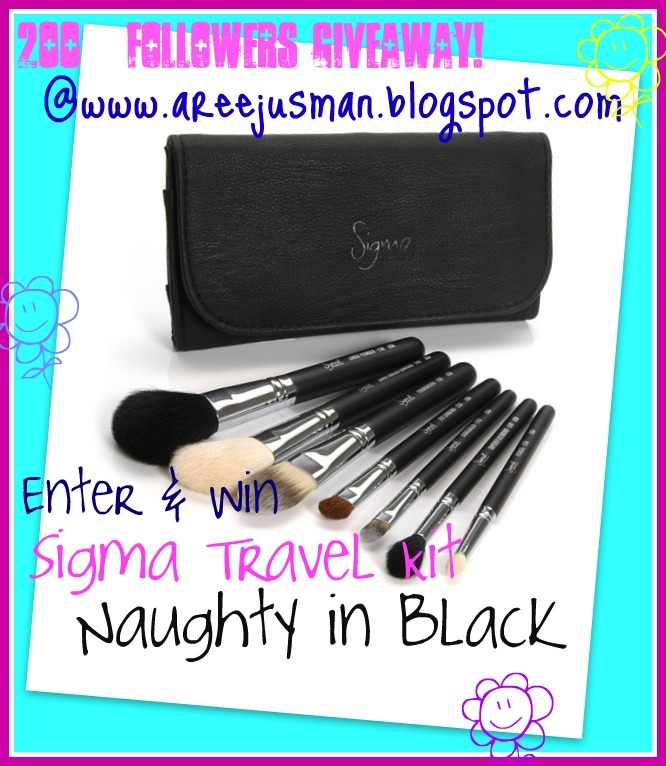 This Giveaway is SIGMA sponsered so lets see what we have this time! If you want to read my review on this travel kit click here. Travel Kit Naughty in Black contains seven essential brushes to achieve a flawless look on the go. Take Naughty in Black to your favorite travel destination or keep it in your purse for a quick touch-up during the day or an evening out on the town. All brushes are individually stored in a stylish metallic black clutch equipped with a convenient pouch to carry all your must-have makeup items. The maximum number of entries that a person can get is 20. This Giveaway starts today on July 6th & ends on July 31st! really wanted to try this kit soo bad!! I liked/follow your fb, twitter and blog. thank you so so much for this giveaway. I have been trying to win/get one of this travel brush sets forever. I am also twitter follower and I tweeted about this giveaway. Follow my blog Publicly with Google Friend Account (GFC)- DONE! Like my Facebook Page & mention the name with which you have LIKED my page- DONE! Follow Me on Twitter & Tweet this Giveaway.Mention @AreejUsman in the tweet so I can check back. – DONE!